Archive by category"Education, Research and Vocational Training"
Early childhood education is one of key focus in both national and the county government. This is why the environment under which the children are studying in ought to be well taken care of in terms of shelter. The Department of Education and Vocational Training through a public participation held at ward level identified schools where construction of ECDE centres is now ongoing. Governor Sang together with CECM Education Valentine Chumo and the Chief Officer Mr. Daniel Sang held a consultative meeting with the managers of all the 15 vocational training centres who are in charge of the ECDE construction to discuss about the progress of the ECDE construction and future monitoring plans. 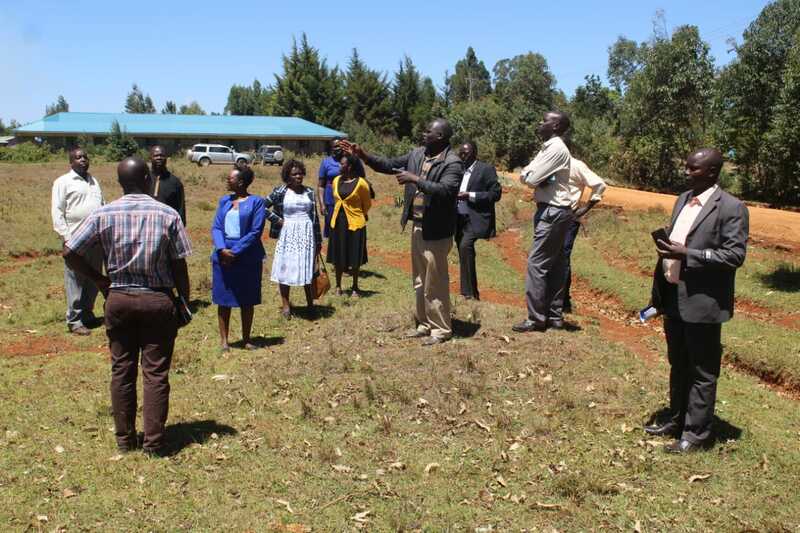 The managers gave different views and commended the department citing that although there have been challenges, most of the projects are on-going and there is a constant supply of building materials. The Chief Officer said that the combined efforts and good relations between the managers and the responsible personnel from the department is what will propell the construction work to move faster in the near future. The CECM applauded the managers and asked them to work closely with the responsible staff members to ensure all the materials supplied are of good quality, enough and are delivered on time. 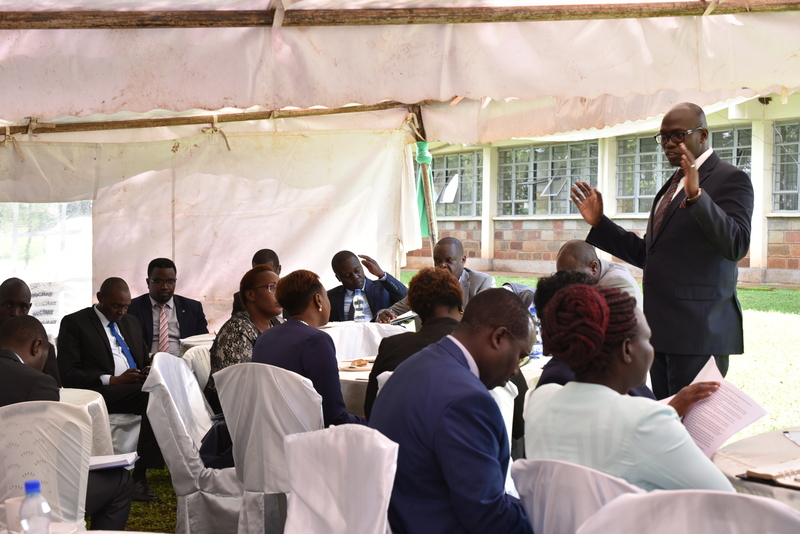 The Governor also added that they should work timely in order to meet their time frame and affirmed that the new ECDE classrooms constructed will improve quality of Education in Nandi because the children will be learning in an ample environment. The County Government of Nandi funded the construction of 120 ECDE classrooms across the county for the financial year 2017/2018 and another 120 classrooms for the financial year 2018/2019. Ag. 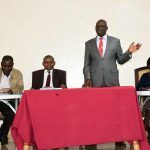 County Secretary Dr. Francis Sang has applauded Kisii University for offering school programs aimed at promoting Corporate Social Responsibility (CSR). Dr. Sang said CSR is now a need in the society, adding that most organizations now require CSR initiatives as part of their initiatives of giving back to the community. Speaking at Kapsabet ASK grounds during the 6th graduation ceremony for Kisii University’s Eldoret Campus, Dr. Sang further commended the Institution for offering opportunities for students to further their skills to become competent in the ever changing situations around the world. He added that the appropriate implementation of these skills offers citizens with more choices and thus enhancing the betterment of one’s livelihood and in the end, helps in the economic growth and development of the nation. ‘I urge the youth to grab these opportunities in such institutions of higher learning, improve their career opportunities and eventually better livelihoods.’ advised Dr. Sang. 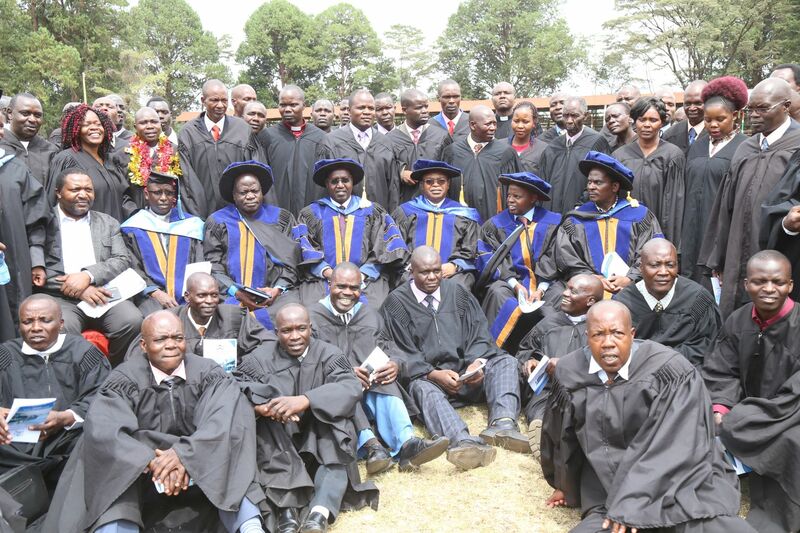 Over 100 pastors who undertook the Pastor’s enhancement training program graduated. The County Government of Nandi has been championing for development in all parts of the county to see that all the projects that were started are fast-tracked by the departments and their benefits felt by the residents. The construction of ECDE centres across the county is one of the projects done by the county government through the Department of Education and Vocational Training under the Labour based policy. So far construction of 60 ECDE centres is ongoing across the 30 wards some of which are complete. Each ECDE centre consists of 2 classrooms, a reception, a care-giver office and a storage room. In order to ensure smooth running and easy management of resources, the Department of Education and Vocational Training has shifted from labour based policy to using development committee. The Department has embarked on an exercise to elect the committee to oversee the construction of ECDE centres for the financial year 2018/2019. The policy is the diversion from the current labour based which was a pilot project for constructing of 2 ECDE Centres in each of the 30 wards in the county. The program has had numerous challenges hence need for the new policy. The new policy empowers the local school management to utilize the funds allocated. It requires that the school allocated funds shall have a seven-member committee which include school head-teacher, BOM chairperson, ECDE teacher, a representative of the ECDE parents, representative of sponsoring body if any, representative of the person living with disability and gender representative. The seven shall be the fund committee members. The policy is envisioned to fasten the construction works through community involvement.The role of the department will be conducting regular inspections through monitoring and evaluation team involving the department of public works. In a statement by the CECM Valentine Chumo, the construction of ECDE centres can be well managed if the community takes charge of every activity including managing of financial resources. “We have had challenges before using the labour-based policy and as the department we felt that the work is being slowed down and therefore it is important to let the local community own this project and for a fact, it will not be easy to let down what you own. We let them sit down elect their officials who they trust to manage the project,” she said. The CECM added that the new policy will be bound to maximum accountability and transparency and the outcome of the efforts shall be a direct benefit to the community. Mr Benson Savala, one of the elected members appreciated the county for considering their school since it has a good number of pupils. “First of all we are glad that our school was considered. We have so many schools in this ward alone but ours was chosen; we are very lucky. I will rally people to support government projects to ensure that they are completed within stipulated time,” he said. The election which took place in 2 ECDE centres in every ward identified through a public participation exercise was overseen by the Sub County administrators of the respective sub counties assisted by the ward administrators where the participants were the ECDE parents. The school shall be required to open a bank account with the head teacher of the mother school, BOM chair and the ECDE teacher being the signatories. The fund committee members elected shall be inducted before the fund is wired into the account of the school. 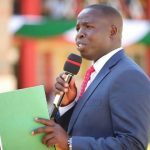 In his manifesto, Governor Stephen Sang had promised the residents of Nandi that he would ensure that needy students benefit from the county bursary scheme. In the year 2018,the County Government through the Department Of Education and Vocational Training disbursed a total of Ksh 60,000,000 set aside for bursaries to 6,434 needy students from the county. The 6,434 students comprised of students in secondary Schools, Vocational Training Institutions, Universities/Colleges and special needs. In the FY 2018/2019, the county set aside Ksh 60,000,000 for bursaries. Already the county has received Ksh. 45,000,000 from the National Treasury for bursaries. The remaining Ksh. 15, 000,000 will be released by the Treasury in the last Quarter of the Financial Year. This is as per the National Treasury Formula of releasing Funds to counties. 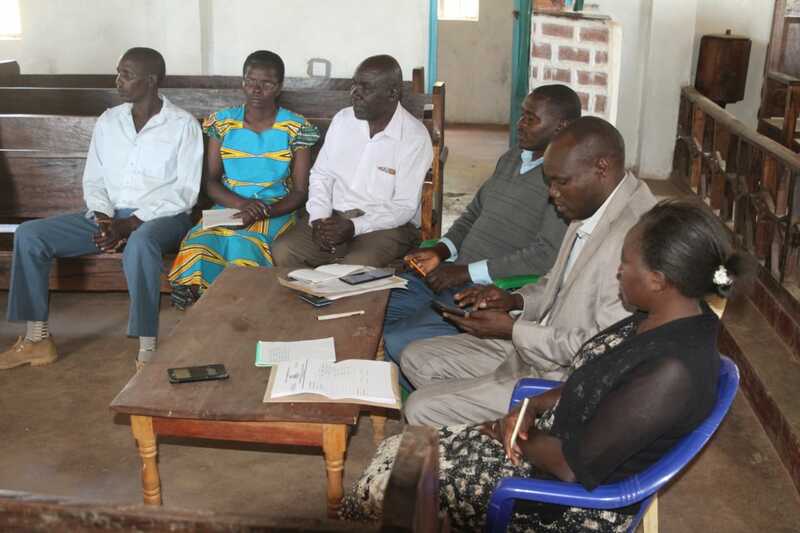 In November 12th -19th Nandi County Bursary Fund Committee (NACEF) organized public participation forums across the 30 wards to identify the beneficiaries for the year 2019. 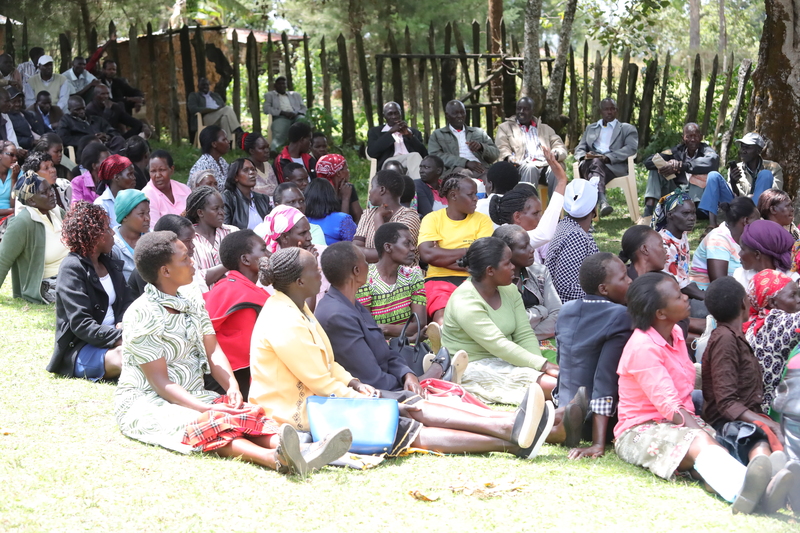 During the forums, the committee allowed residents to identify needy students and their role was to enlist the beneficiaries as proposed by members of the public. The committee then sat and embarked on verification process. 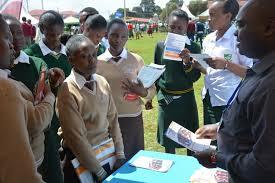 A total of 6,117 needy students were identified and awarded bursaries. Of the 6,117 students 2,360 are in Secondary Schools, 1,958 are in Universities and Colleges, 1,216 are in Vocational Training Institutes and 591 Students in the Special needs category. The allocation formula to the four categories was Secondary Schools (30%), Universities/Colleges (30%) Vocational 30% and Special needs (10%). The County Government has disbursed Ksh 40,381,475 to beneficiaries in Secondary Schools, Vocational Training Colleges and Special Needs category. A balance of Ksh. 1,618, 525 still awaits identification and award from wards that had not fully exhausted their allocation to make a total of Ksh 42,000,000. The remaining Ksh. 3,000, 000 will be added to Ksh 15,000, 000 that the treasury will release in the last quarter to make a total of Ksh 18,000,000 that will go to university students. University and College Students will receive their disbursements once the National Treasury releases the remaining Ksh. 15,000,000. 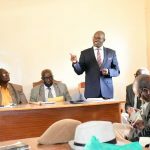 INDENTIFICATION OF 60M BURSARY BENEFICIARIES KICK OFF. The County Government of Nandi through the Department of Education and Vocational Training has embarked on an exercise to identify this next year’s bursary beneficiaries. This exercise aims at identifying bright and needy students in the County trough public meetings that have already kicked of across the County. A total of 60 million shillings was allocated for the bursary kitty in the 2018- 2019 financial year where every ward will get 2 million each. The money distributed through the County bursary fund is meant for learners in University, Colleges, Vocational Polytechnics, Secondary schools in a ratio of 30:30:30:10. Respectively. This bursary distribution exercise will be overseen by the County Education Fund Committee where beneficiaries for the first term next year. 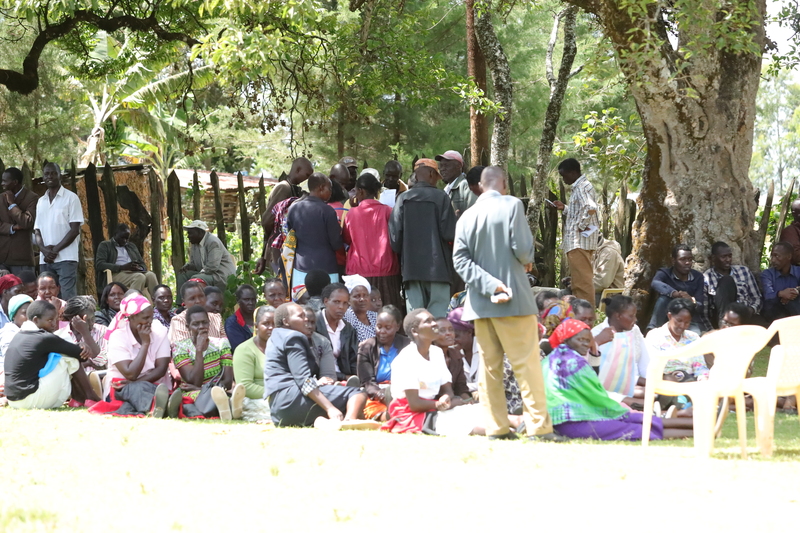 According to Education and Vocational training CECM Valentine Chumo, the exercise is open, fair and transparent since the program targets only needy cases in every village within the county. 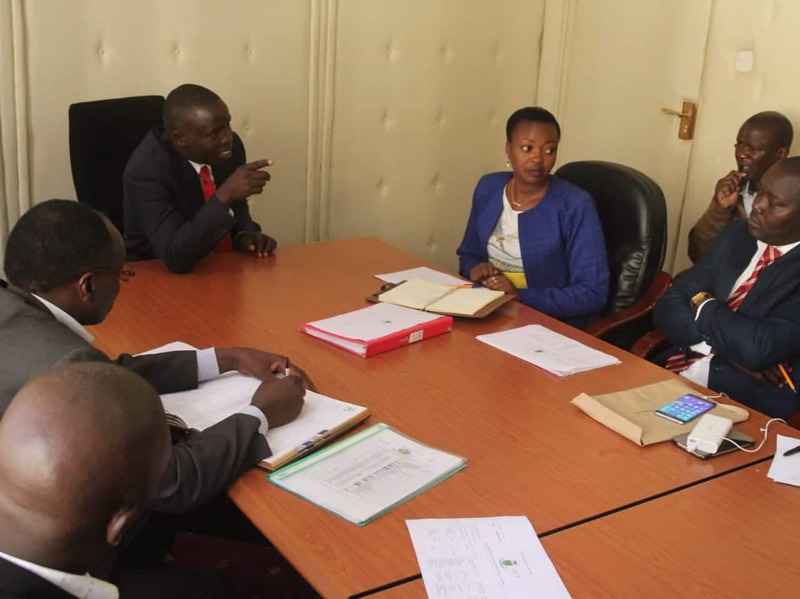 Chumo further says that in the spirit of the CBEF act that governs the management of the bursary kitty, her office will exercise due diligence to ensure that most deserving student’s get the County Government support through the bursaries. “We undertake as department to be in the fore-front in supporting skill development and ensure that enrollment of students in schools remains steady as we seek to help our learners persue their dreams without being distracted by lack of school fees or status of their homes.” Chumo said. Unemployment is an alarming challenge that has seen educated youth waste away in so many struggles due to the limited job opportunities. The annual graduations that are highly celebrated, be they certificates, diplomas or degrees carry a lot of joy for excellence only for them to mutate into anxiety and restlessness soon after due to the limited job market. Youth end up taking any available opportunities to make ends meet. The County Government of Nandi through various departments is intentional in addressing the challenges facing the youth in Nandi County. 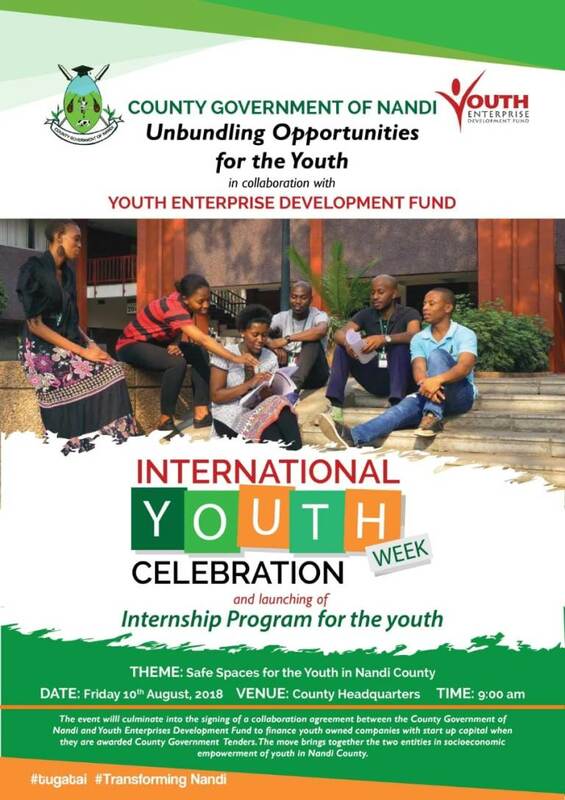 As the International Youth Week comes to wrap up, the county government is set to unbundle the opportunities that seek to improve the state of the youthful population. The Department of Public Service has unveiled 400 internship opportunities for the youth across the county. This is in line with Governor Stephen Sang’s manifesto that pledged to create internship opportunities for the youth so as to enable them acquire the necessary skills and experience as they enhance their professional growth. The opportunities that do not require any past working experience is open to any youth with a certificate, diploma or degree from a reputable institution. This will ensure that skilled and deserving youth who may not have had an opportunity to work after their schooling get a chance to work and acquire the required experience as they also serve Nandi County. The interns will be paid a stipend of between Ksh. 8,000 and Ksh. 12,000. Applications can be done through <a href=”https://interns.nandi.go.ke”/> https://interns.nandi.go.ke . Among other opportunities set for the youth on this day include enhancement of the 30% Access to Government Procurement Opportunities. Most youth with start-up companies lack capital even after winning the tenders thus affecting the quality of works done. In a bid to bridge this gap, the county government is set to sign an MoU with Youth Enterprise Development Fund so as to increase the uptake of tenders by youths in the various county departments, and linking up with institutions that provide youth friendly loans for LPOs and LSOs. On to top of this, the county government is heading towards Performance Based Contracting that enable the youth organize themselves and benefit from the County Government’s funds for maintenance of roads in each ward by performing tasks such as bush clearing, drainage opening, installing culverts etc. Contracts under this program will run for a period not less than 1 year and not more than 3 years.The youth has a role in protecting the environment. The Department of Youth in conjunction with that of Environment is set to offer youth opportunities to benefit from being engaged in planting trees, establish nurseries and supply the seedlings to the county government under an agreed framework. 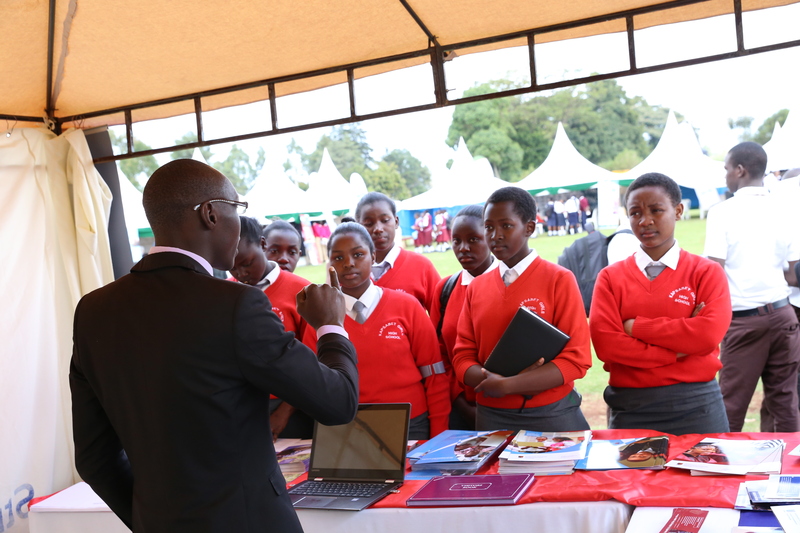 Among other programs are entrepreneurial training and start-up support, sponsorship for training and acquisition of technical skills and opportunities for scholarships and sponsorship’s based on talent where the county government will identify, exploit and support in the development of youth talent while engaging stakeholders who can extend scholarship opportunities for such talents. A committee chaired by Deputy Governor Dr. Yulita Mitei that is tasked with the process of aligning the County Integrated Development Plan (CIDP) with that of the National Government’s Big Four agenda held a meeting to deliberate on the structure that is going to guide and align county’s agenda with the National’s agenda of the Big Four. The County Government of Nandi is seeking to seize and leverage on this timely opportunity and fit in the national government’s plans as it strives to transform lives through manufacturing, Agriculture, affordable housing and universal healthcare.